Who knew social media could cause so much controversy? (Or actually, who didn’t know). 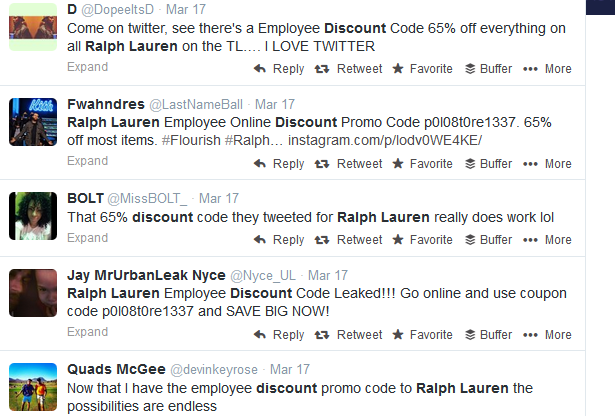 Ralph Lauren found itself in a hotspot this week after an employee leaked a 65% off employee discount code on Twitter. Not only was the code leadked on Twitter, an employee’s user information was leaked on Instagram, providing users another way to access the employee discount. The code went viral on Twitter, and was consequently shared to coupon sites across web. The Ralph Lauren Discount Code went viral on Twitter. The result? Thousands of orders were placed using the employee discount. Some shoppers used the codes slightly more “ethically”, purchasing items like polo shirts and sweaters for under $100. Others tried their luck at purchasing expensive bags and even home decor, such as a nearly $6,000 chandelier. Ralph Lauren says it will honor most of the orders, except for those that went overboard. The company also claims the code wasn’t released on purpose, a claim which raises skepticism from many. The mix-up certaintly has provided Ralph Lauren with a lot of press, and even helped clear up an excess inventory problem the company was facing with Fall and Winter inventory. The learning here- social media can be a blessing in disguise for some businesses.